There have been many times that I’ve been in a lecture hall and I see someone across the room yawn and two seconds later I see someone close to them yawn. Why is that? 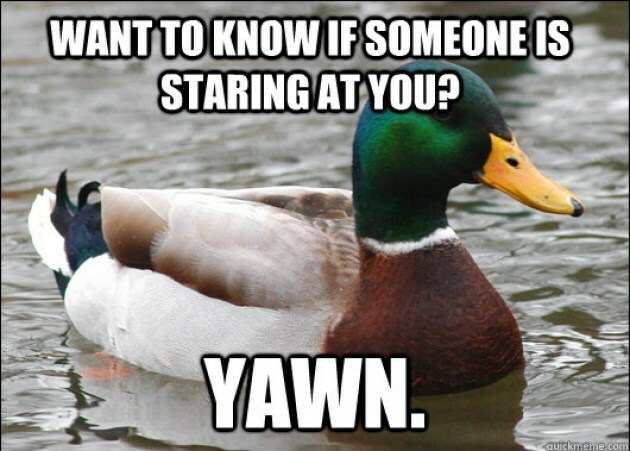 I’ve also noticed that that when I’m aware that someone around me yawned, I usually don’t yawn, but if my attention is elsewhere then there’s higher possibility that I’ll yawn. Is yawning really contagious? The reasons we yawn in the first place usually have to do with how bored or tired we are. The idea that we yawn due to lack of oxygen in the brain is a myth. Another possible reason for yawning is to cool down the brain because more people yawn in the winter than in the summer. As for contagious yawning, that doesn’t start until were about four. 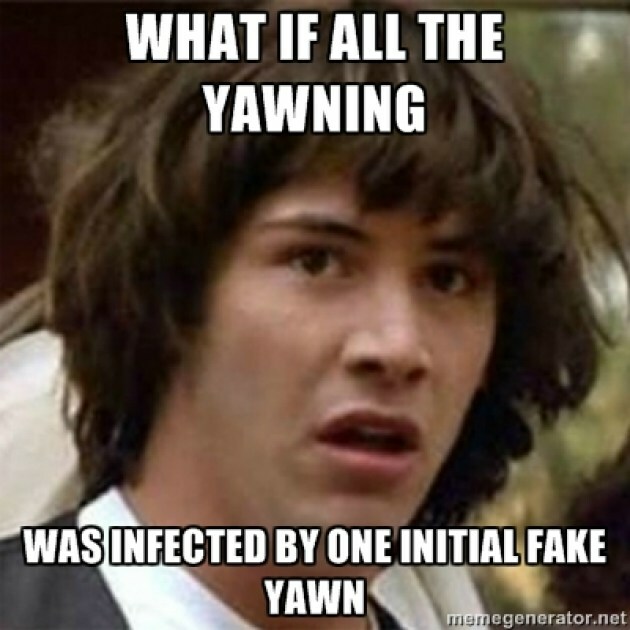 A study was done to test how contagious yawning really is. There were 328 participants in the study who all watched a 183 second video that included images and video of people of different ages, genders, and ethnicities yawning. The two categories the subjects were put into were people who contagiously yawned at least once and those who didn’t yawn at all. They used a p-value of 0.01. 67.7% of the participants contagiously yawned between one and fifteen times. The p-value was statistically significant at 0.002. The study also showed that younger people contagiously yawned more than older people. Although yawns are often correlated with boredom, that is not always the case. Contagious yawning is related to empathy. You’re more likely to contagiously yawn if someone you know personally has just yawned. In fact, it’s possible that yawning is a way of internal communication. So although there is no specific reason as to why we yawn, at least it’s something we all share. I have always wondered if this was true. I always thought there was a chemical that came out of our bodies when we yawned that made others around us yawn. Yawning when tired and bored are normally the two things that pop up into peoples minds. After clicking on your blog post, I immediately yawned after reading the title which leads me to believe that yawns are contagious. It is interesting to think that something as simple as a yawn can have such a wide effect on people. 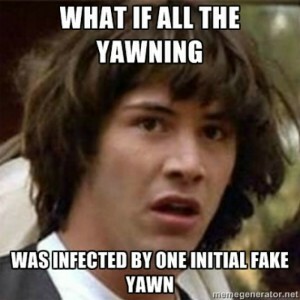 This is why your post led me to wonder where did yawning come from? According to neuroscientist and yawn expert Robert Provine, yawning is something that is autonomic and ancient because it has come from an early evolution and is so common to many creatures- not just humans. It is interesting to think that something as simple as a yawn can have such a wide effect on people. If you would like to read more information about where yawning comes from, please click on the link below. Did you know that yawns can be “contagious” across species too? Scientists have observed animals yawning after watching humans yawn as well. This includes everything from a dog to a bird to a chimpanzee. The scientists think this is because these animals all mimic the human actions they see. I really like the sources you used in this blog. Whenever I read a blog post, I always take the conclusions people come to with a grain of salt, but if they include actual studies in their posts it makes it all the more credible. If anything I’d suggest you flesh out your ideas a bit more and go into a bit more detail as to why scientists think we yawn. I have always wondered this. I just assumed that it was a real thing, but I never looked at any experiments on this theory. I like how you explained the multiple different causes of yawns, and some other misbeliefs about yawning. A p-value of .002 is very good, so that would give them good reason to reject the null hypothesis.